We all remember "Snowmageddon" in February of 2010. Even as Washington, D.C., saw 32 inches of snowfall for the month of February—more than it has seen in any February since 1899—conservatives decided to use the weather to mock global warming. Oklahoma Senator James Inhofe and his family even built an igloo on Capitol Hill and called it "Al Gore's New Home." Har har. Yet at the same time, scientific voices were pointing out something seemingly counterintuitive, but in fact fairly simple to understand: Even as it raises temperatures on average, global warming may also lead to more intense individual snow events. It's a lesson to keep in mind as the northeast braces for winter storm Janus—which is expected to deliver as much as a foot of snow in some regions—and we can expect conservatives to once again mock climate change. To understand the relationship between climate change and intense snowfall, you first need to understand that global warming certainly doesn't do away with winter or the seasons. So it'll still be plenty cold enough for snow much of the time. Meanwhile, global warming loads the dice in favor of more intense precipitation through changes in atmospheric moisture content. "Warming things up means the atmosphere can and does hold more moisture," explains Kevin Trenberth, a climate scientist at the National Center for Atmospheric Research in Boulder, Colo. "So in winter, when there is still plenty of cold air there's a risk of bigger snows. With east coast storms, where the moisture comes from the ocean which is now warmer, this also applies." 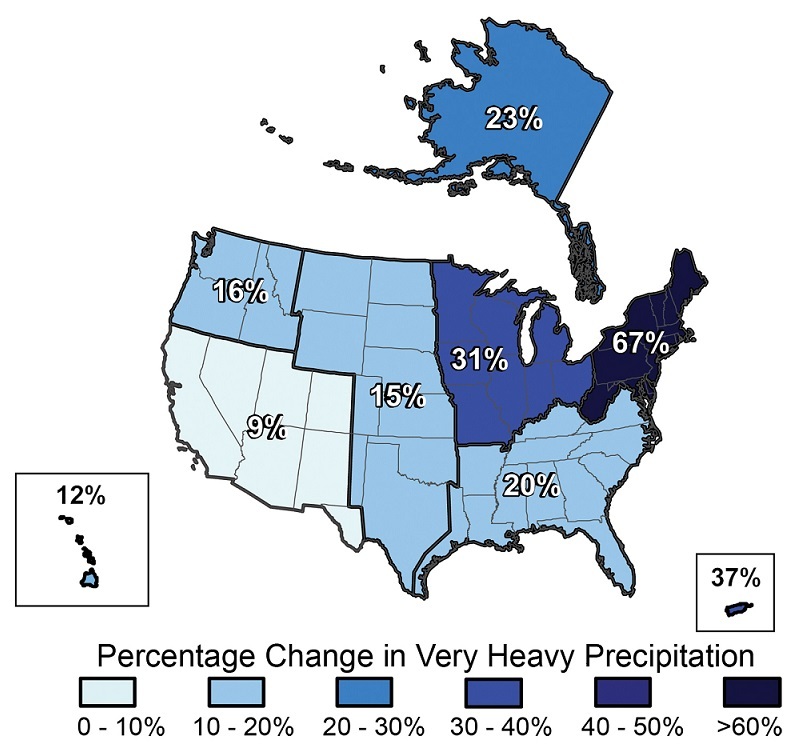 Percent increases in the amount of precipitation occurring in the heaviest precipitation events from 1958 to 2007. US Global Change Research Program. "More winter and spring precipitation is projected for the northern U.S., and less for the Southwest, over this century," adds the draft US National Climate Assessment. Precipitation of all kinds is expected to increase, the study notes, but there will be large regional variations in how this is felt. "The old adage, 'it's too cold to snow,' has some truth to it," observes meteorologist Jeff Masters, co-founder of the Weather Underground. "The heaviest snows tend to occur when the air temperature is near the freezing mark, since the amount of water vapor in the air increases as the temperature increases. If the climate in a region where it is 'too cold to snow' warms to a level where more snowstorms occur near the freezing point, an increase in the number of heavy snowstorms is possible for that region." In fairness, global warming is also expected to decrease overall snow cover, because intense snow events notwithstanding, snow won't last on the ground as long in a warmer world. In fact, a decrease in snow cover is already happening.